Her Assumption Befits the Mother of God | Valentine Long O.F.M. Mary's Death and Bodily Assumption | Lawrence P. Everett C.Ss.R., S.T.D. The Assumption of Our Lady | Rev. James M. Keane O.S.M. The Vatican Council on the Assumption of Our Lady | Dom Jerome Gassner O.S.B. On November 1, 1950, Pius XII defined the dogma of the Assumption. Thus he solemnly proclaimed that the belief whereby the Blessed Virgin Mary, at the close of her earthly life, was taken up, body and soul, into the glory of heaven, definitively forms part of the deposit of faith, received from the Apostles. To avoid all that is uncertain the Pope did not state either the manner or the circumstances of time and place in which the Assumption took place — only the fact of the Assumption of Mary, body and soul, into the glory of heaven, is the matter of the definition. Please see this special section on The Assumption. 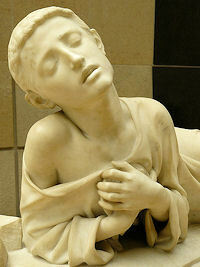 Historically today is the feast of St. Tarcisius, a young martyr of the Eucharist. Now toward the end of the summer season, at a time when fruits are ripe in the gardens and fields, the Church celebrates the most glorious "harvest festival" in the Communion of Saints. Mary, the supremely blessed one among women, Mary, the most precious fruit which has ripened in the fields of God's kingdom, is today taken into the granary of heaven. The Assumption is the oldest feast day of Our Lady, but we don't know how it first came to be celebrated. Its origin is lost in those days when Jerusalem was restored as a sacred city, at the time of the Roman Emperor Constantine (c. 285-337). By then it had been a pagan city for two centuries, ever since Emperor Hadrian (76-138) had leveled it around the year 135 and rebuilt it as Aelia Capitolina in honor of Jupiter. For 200 years, every memory of Jesus was obliterated from the city, and the sites made holy by His life, death and Resurrection became pagan temples. After the building of the Church of the Holy Sepulchre in 336, the sacred sites began to be restored and memories of the life of Our Lord began to be celebrated by the people of Jerusalem. One of the memories about his mother centered around the "Tomb of Mary," close to Mount Zion, where the early Christian community had lived. On the hill itself was the "Place of Dormition," the spot of Mary's "falling asleep," where she had died. The "Tomb of Mary" was where she was buried. At this time, the "Memory of Mary" was being celebrated. Later it was to become our feast of the Assumption. For a time, the "Memory of Mary" was marked only in Palestine, but then it was extended by the emperor to all the churches of the East. In the seventh century, it began to be celebrated in Rome under the title of the "Falling Asleep" ("Dormitio") of the Mother of God. 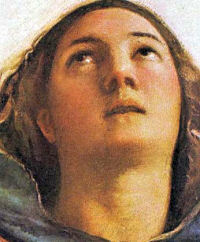 Soon the name was changed to the "Assumption of Mary," since there was more to the feast than her dying. It also proclaimed that she had been taken up, body and soul, into heaven. At the Council of Chalcedon in 451, when bishops from throughout the Mediterranean world gathered in Constantinople, Emperor Marcian asked the Patriarch of Jerusalem to bring the relics of Mary to Constantinople to be enshrined in the capitol. The patriarch explained to the emperor that there were no relics of Mary in Jerusalem, that "Mary had died in the presence of the apostles; but her tomb, when opened later . . . was found empty and so the apostles concluded that the body was taken up into heaven." In the eighth century, St. John Damascene was known for giving sermons at the holy places in Jerusalem. At the Tomb of Mary, he expressed the belief of the Church on the meaning of the feast: "Although the body was duly buried, it did not remain in the state of death, neither was it dissolved by decay. . . . You were transferred to your heavenly home, O Lady, Queen and Mother of God in truth." All the feast days of Mary mark the great mysteries of her life and her part in the work of redemption. The central mystery of her life and person is her divine motherhood, celebrated both at Christmas and a week later (Jan. 1) on the feast of the Solemnity of Mary, Mother of God. The Immaculate Conception (Dec. 8) marks the preparation for that motherhood, so that she had the fullness of grace from the first moment of her existence, completely untouched by sin. Her whole being throbbed with divine life from the very beginning, readying her for the exalted role of mother of the Savior. The Assumption completes God's work in her since it was not fitting that the flesh that had given life to God himself should ever undergo corruption. The Assumption is God's crowning of His work as Mary ends her earthly life and enters eternity. The feast turns our eyes in that direction, where we will follow when our earthly life is over. The feast days of the Church are not just the commemoration of historical events; they do not look only to the past. They look to the present and to the future and give us an insight into our own relationship with God. The Assumption looks to eternity and gives us hope that we, too, will follow Our Lady when our life is ended. In 1950, in the Apostolic Constitution Munificentissimus Deus, Pope Pius XII proclaimed the Assumption of Mary a dogma of the Catholic Church in these words: "The Immaculate Mother of God, the ever-virgin Mary, having completed the course of her earthly life, was assumed body and soul into heaven." With that, an ancient belief became Catholic doctrine and the Assumption was declared a truth revealed by God. In the Germanic countries, the custom of blessing herbs is associated with 15 August. This custom, received into the Rituale Romanum, represents a clear example of the genuine evangelization of pre-Christian rites and beliefs: one must turn to God, through whose word "the earth produced vegetation: plants bearing seeds in their several kinds, and trees bearing fruit with their seed inside in their several kinds" (Gen 1, 12) in order to obtain what was formerly obtained by magic rites; to stem the damages deriving from poisonous herbs, and benefit from the efficacy of curative herbs. This ancient use came to be associated with the Blessed Virgin Mary, in part because of the biblical images applied to her such as vine, lavender, cypress and lily, partly from seeing her in terms of a sweet smelling flower because of her virtue, and most of all because of Isaiah 11, 1, and his reference to the "shoot springing from the side of Jesse", which would bear the blessed fruit of Jesus. This Blessing of Herbs is included in the prayers library. In an age of sensuality and materialism the Assumption points out the dignity and destiny of our human body, extols the dignity of womanhood, and turns our eyes to the true life beyond the grave. At Mass today ask Mary for the grace to keep your mind fixed on things above and to aspire continually to be united with her and to be brought to the glory of the Resurrection. Tarcisius was a twelve-year-old acolyte during one of the fierce Roman persecutions of the third century, probably during that of Valerian. Each day, from a secret meeting place in the catacombs where Christians gathered for Mass, a deacon would be sent to the prisons to carry the Eucharist to those Christians condemned to die. At one point, there was no deacon to send and so St. Tarcisius, an acolyte, was sent carrying the "Holy Mysteries" to those in prison. On the way, he was stopped by boys his own age who were not Christians but knew him as a playmate and lover of games. He was asked to join their games, but this time he refused and the crowd of boys noticed that he was carrying something. Somehow, he was also recognized as a Christian, and the small gang of boys, anxious to view the Christian "Mysteries," became a mob and turned upon Tarcisius with fury. He went down under the blows, and it is believed that a fellow Christian drove off the mob and rescued the young acolyte. The mangled body of Tarcisius was carried back to the catacombs, but the boy died on the way from his injuries. He was buried in the cemetery of St. Callistus, and his relics are claimed by the church of San Silvestro in Capite. In the fourth century, Pope St. Damasus wrote a poem about this "boy-martyr of the Eucharist" and says that, like another St. Stephen, he suffered a violent death at the hands of a mob rather than give up the Sacred Body to "raging dogs." His story became well known when Cardinal Wiseman made it a part of his novel Fabiola, in which the story of the young acolyte is dramatized and a very moving account given of his martyrdom and death. Tarcisius, one of the patron saints of altar boys, has always been an example of youthful courage and devotion, and his story was one that was told again and again to urge others to a like heroism in suffering for their faith. In the Passion of Pope Stephen, written in the sixth century, Tarcisius is said to be an acolyte of the pope himself and, if so, this explains the great veneration in which he was held and the reason why he was chosen for so difficult a mission.